Your search stops here! 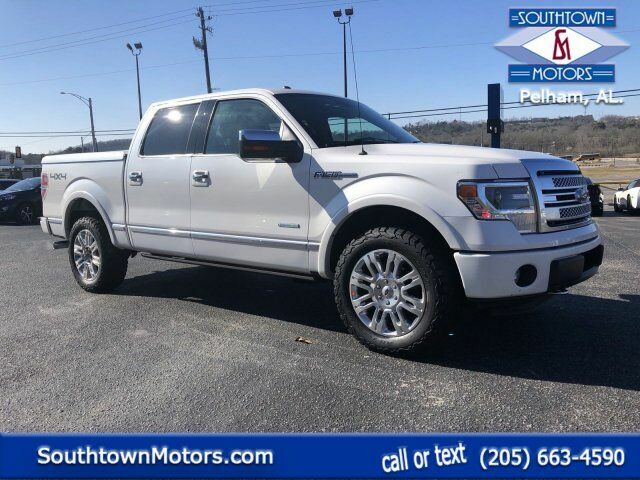 This super clean F-150 Platinum 4WD is a CARFAX One Owner vehicle! Upgraded Alloy Wheels! Bed Cover! Tow Package! Leather! Heated and Vented Seats! XM Radio! You can't go wrong with a F-150! You can't go wrong with SouthTown Motors! Give us a call at (205)394-6700 to lock in your deal! Under frame winch-type spare tire carrier w/safety catch & lock, Trailer sway control, Tire pressure monitoring system, SOS post crash alert system, SecuriLock passive anti-theft system (PATS), Safety canopy front/rear outboard side curtain airbags, Removable tailgate w/key lock & lift assist, Remote keyless entry key, Rear pwr point, Pwr rack & pinion steering. This Ford F-150 has a dependable Turbocharged Gas V6 3.5L/213 engine powering this Automatic transmission. Pwr front/rear disc brakes, Pwr door locks w/autolock feature, Perimeter Alarm, Outboard front lap & shoulder safety belts -inc: height adjusters, pretensioners, energy management retractors, Long-spindle double wishbone front suspension w/coil-over-shock IFS, Leaf spring rear suspension w/2-stage variable rear springs, Illuminated entry, Hill start assist, Gauges -inc: fuel gauge, voltmeter, oil pressure, engine coolant temp, speedometer, tachometer, odometer, Full size spare tire, Front pwr point, Front passenger side A-pillar grab handle, Dual stage driver & passenger front airbags, Dual stage driver & front passenger seat-mounted side airbags, Dual note horn, Driver & front passenger door scuff plates, Dome light, Auto lock safety belt feature for child seats, Anti-lock braking system (ABS), AdvanceTrac w/Roll Stability Control (RSC). Test drive this must-see, must-drive, must-own beauty today at Southtown Motors, 2841 Pelham Pkwy, Pelham, AL 35124.